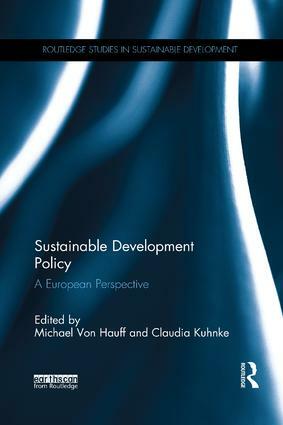 Sustainable Development Policy: A European Perspective uses a variety of multidisciplinary perspectives to explore the ways in which sustainable infrastructures can play a more prominent and effective role in international development policy. Building on a solid introduction to sustainability and development policy, this book discusses ways in which viable reform can be promoted through coherent governing, the design of social security systems, education systems and the possibilities of fair trade as an alternative trading concept . Sustainable Development Policy generates a platform on which to encourage constructive dialogue on issues surrounding sustainability in the wake of the global scarcity of natural and economic resources. This edited collection will be of great interest to all students and lecturers of development studies and development policy, as well as researchers from other disciplines looking for an introduction to sustainable development policy and its practical applications. Michael von Hauff is a Professor of Economics at the University of Kaiserslautern, Germany. Claudia Kuhnke is a Research Fellow at the University of Kaiserlautern, Germany.